The EcoPure ECOROF Reverse Osmosis Undersink Filter Set fits the EcoPure ECOP30 Reverse Osmosis Undersink Water Filtration System. These filters help deliver bottled-quality water right to your kitchen sink or refrigerator, perfect for drinking, cooking, coffee and ice. 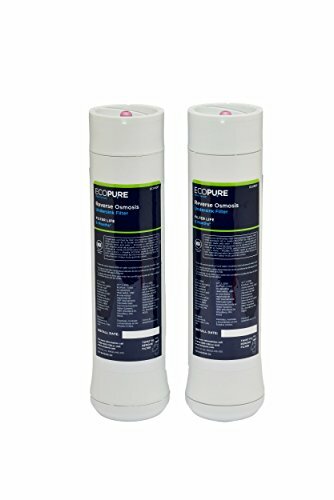 With the EcoPure ECOROF & ECOROM replacement filters, the system reduces or removes many contaminants, including lead, cysts, dissolved solids, chlorine taste and odor, sediment, arsenic (pentavalent), barium, cadmium, chromium (Vl), chromium (III), copper, nitrate, nitrite, radium, selenium, fluoride, turbidity, ammonium, bicarbonate, bromide, chloride, magnesium, sodium, sulfide, tannin, zinc and chemicals. When it comes time to change filters, your faucet indicator light will let you know. Just twist off the old water filters, and twist on the new water filters in less than a minute! Our encapsulated water filter design means that you do not need to turn off the incoming water supply—it’s that easy! To ensure your system is providing the highest quality water, change your filters as recommended. This filter is NSF certified and proudly designed, engineered, and assembled in the USA.